Wednesday was windy and pretty well as forecast on Seabreeze. For the first time this season we set the No 3 jib and a full main. We were cautious at the start not wanting to arrive at the line too early in strong winds and with the full main but took too long to wind in the sails and were late to the start. At first we went low with Hitchhike but had Agrovation right in front and the fleet to windward. Once we gained a bit of free air on the windward yachts we nose ahead of Izzi and went high to keep clear air and have first use of the gusts. Crackerjack had made a cracker of a start and the big 40 footer was leading the fleet downwind. 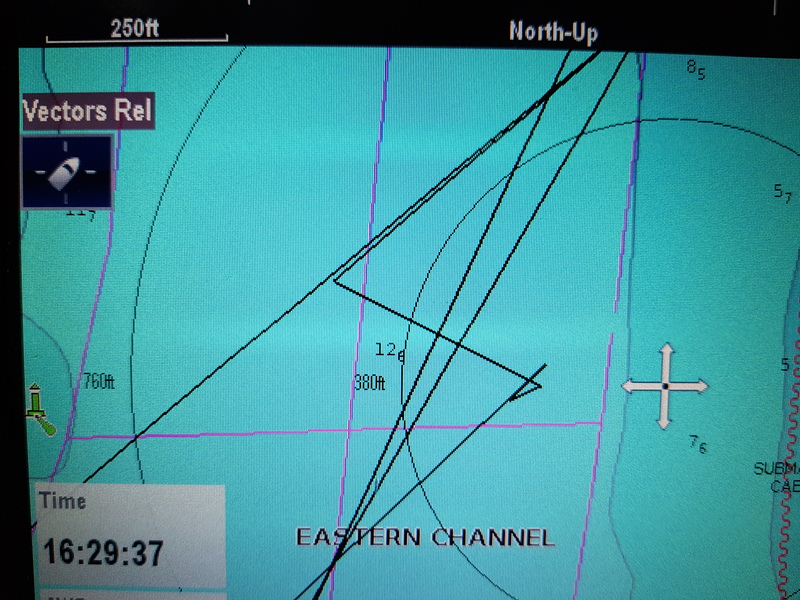 We were catching her and had we obtained an overlap might have had a better day but we failed went around with Hitchhike below and getting their sails on quicker. With our sails still flogging Hithchike came up from below and forced the tack. 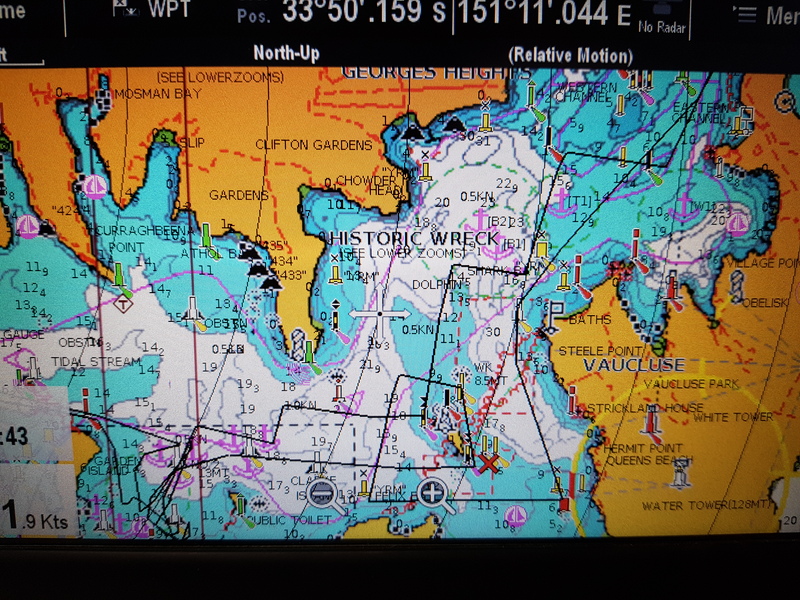 Once on port tack heading back to Steel Point we appeared to be making time on Crackerjack and holding Hitchhike but when a starboard tacking Div 2 boat came across I did not want to try to bear away in the breeze. We were now on Starboard but did not have the sails trimmed well and were dropping below the line of Joli who then held us up from tacking back to port for far too long. We were now the most windward of the fleet and too close to the influence of the land so we had a very difficult work for the rest of the way to Steel Point. Allegro had tacked in front of us on the way to Steel Point and her dirty air made matters worse. Despite these problems we still had a small lead on Amante which we held around Shark Island until the work back to Rose Bay. Again we did not maintain our height and had to wait for Amante to tack. The last leg back to the finish was enough off a beat to let us make up ground on Amante but she played well and did not let us get an overlap. Amante finished 6 seconds in front and will do better when she has a clean bottom. We were two and a half minutes behind Hitchike and Allegro. This was Allego’s widest margin on Passion X for the season and shows how well they sailed to be second on handicap and first on point score for the season. Crackerjack hung on to beat us by half a minute and for their best result of the year and a first on handicap. Joli was two minutes in front and just in front on handicap but they are third on point score while carrying a DNS so have been doing remarkably well. Our minor adjustments for the coming weeks will be to crank the backstay on even tighter in the windy conditions. I have eased the lower D1s a turn to help the bottom of the mast bend. It is sleeved for the first 5 metres and is very stiff below the lower spreaders. We need to tighten up our mark roundings and will practice going wider so that we do not drop below the following fleet. On the bright side we kept well clear of any other yachts and enjoyed a very quick race. It was good to be near the top of the fleet on the first run and with a better start we might have been first to the mark. 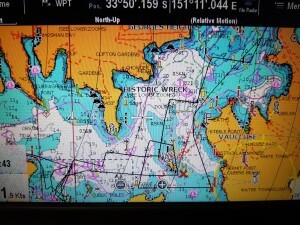 Our Achilles heel is still the windward working in the breeze but we are improving. A sea breeze arrived at least an hour earlier than expected and while light it was enough to get the fleet away for a race shortened at the top of Shark island. At five knots the wind was enough to sag the forestay and build a little depth into the luff of the genoa and once that was achieved we settled down for a quiet work to the heads. The breeze was quite shifty and the yachts that picked up one or two good shifts did well. Agrovation was up near the front of the fleet on the work courtesy of some good tactics. 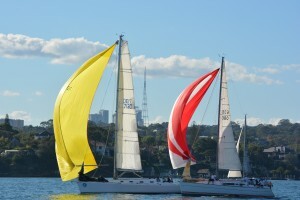 We lost out to leeward of the fleet but came back on the first header and settled down among the top half dozen yachts. Joli and Passion X had a little tacking duel with Joli getting the better of the last bit of breeze to the right of the course and steaming over the top of Passion X. Around the top mark we could see Foreign Affairs off in the distance while Krakatoa, Joli, Crosshaven and Allegro gave chase. We rounded behind Joli but lost ground trying to pole out the genoa. Once we abandoned that idea we set out after the the top five and had occasional bursts of speed. Several times we got within boat lengths of Allegro but could not break through. Whenever we were caught in their dirty air we were particularly slow and on the beat from Point Piper to the finish we had to tack away for clear air and a one minute deficit on Allegro. Joli did particularly well on the broad reach to pass Krakatoa by a minute at the finish. We picked the breeze quite well on the long windward work to the heads but as mentioned suffered whenever we were in disturbed air. A number of short tacks away for clear air helped and it also helped that the breeze freshened and lifted from the right. The broad run in the very light air was frustrating but we did pull out seven minutes on Agrovation and The Biz and did pass Carats so we should not complain. The crew from last week squinting into the sun for a group photo. The forecast for the breeze on Sunday for the second West Harbour Winter Series race was perfect. By that I mean it happened just as forecast because right on cue the wind dropped to nothing leaving us drifting to the line. What was less than a few minute arrears on the leaders ended up eight and without that lost time we might have been second placed thanks to an improving handicap. On ORCi we were less than two minutes away from the third placed Flying Tiger and while the ORCi fleet is tiny the corrected time differences are a good gauge of how we are improving. We did get to fly the big yellow mast head spinnaker twice and while still slow on the sets are getting the take downs closer to the mark. Notable we made up time on the beam reach which was a bit too tight for the symmetric spinnaker. In the light conditions it might be possible to drop the sock into the hatch leaving the clews attached to the sheets ready for the next hoist so there is a thought to play with. In the light airs the sail settings are still a compromise as we need forestay sag to get flow near the luff of the genoa but need the backstay on tight to bend the mast and free the leech of the main. The next project will be to see how we can sit the boom on the vang strut so we can sag the forestay. It is a late report but only because I have been very busy working for a client and for Elaine. I worked to 4 am Friday morning for a deadline and today painted the lounge room. I hope both the paying client and the non paying one are happy. Now for the report on the sailing on Wednesday. We had another lovely Autumn day on the harbour and a visit from my brother from Perth to augment the crew. The extra crew was desirable as the forecast was on the margin between No 1 genoa and No 3 jib. We opted for the No 1 genoa but left the lazy jacks up in case we needed to reef the main in a hurry. At the start we were as leeward of the fleet as we could be but found Joli even further to leeward aiming to be the first to the pin. Unfortunately for both of us there was a very large header just before the start which found us both pinching to make the mark. We would have cleared but Joli was so low they were stuck head to wind on the pin and we had to hold back for what seemed like an age for them to round the mark and restart. By the time we were able to clear the bow of Joli the fleet was well away. A broad reach is our best angle and we quickly caught all but Fidelis. As the wind died Hitchhike pulled through to leeward and we rounded the mark in third place. Now this is where things took a turn for the worse as we tacked right on the mark back into the starboard running fleet coming up to the mark. We could not go above the windward boat if it headed up but if it headed up we could go to leeward through the gap with Krakatoa to leeward. Unfortunately I misunderstood the intention of the windward right of way boat which left no choice but to shoot the gap and hope for the best. Unfortunately Krakatoa had boats to leeward and could not give us more room so we had a collision. Don on Krakatoa was most gracious when we went over post race to apologize. It was our first at fault collision in all the years we have raced at RANSA and I have no excuse. 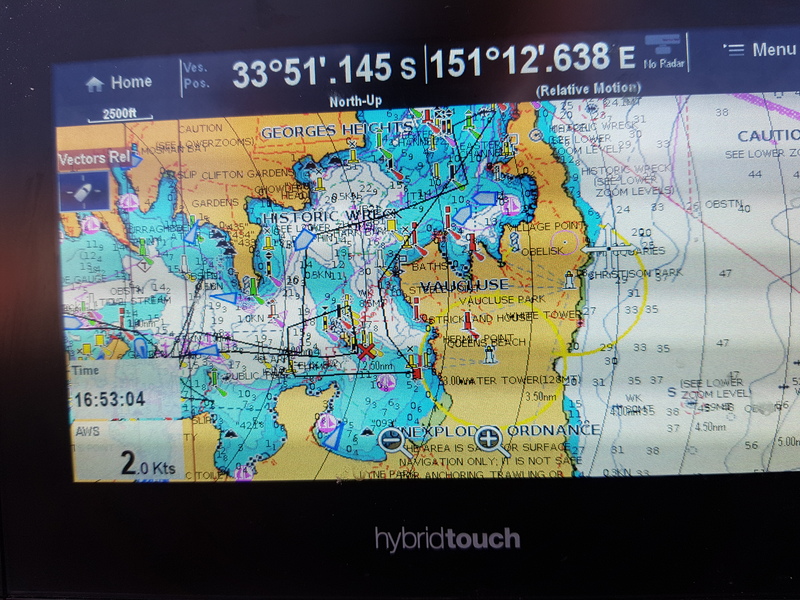 It took time to find a clear area to do the mandatory 720 degree turns and we set off after Amanti and Allegro who had passed us in our tribulations. The two turns allowed Joli to catch up quickly and she caught us on Port and Starboard which required an unplanned tack with the crew still on the rail. The tack away from Joli took us too close to Steel Point and we suffered in the wind shadow. That was the last of the incidents for the day and we made a cautious way home. Ignoring Fidelis which is a rocket ship in the reaching conditions we finished three minutes behind Hitchhike and Amante, two behind Joli and one behind Allegro. After some recalculations we finished 12 out of 16 on handicap and would have needed three minutes to finish in third place. The two incidents were disappointing as we sailed well on the reach when the wind was fresh and did the return windward work better than we sailed last year. I saw some VMG to windward up at the 6 knot mark for the first time and the tighter back stay, flatter mainsail and tighter forestay seem to be working in the heavier winds. 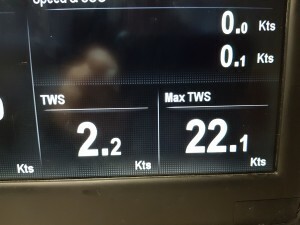 Top wind speed for the day was 22 knots but there was plenty of light air as well. Top boat speed was 10.4 knots. On the bright side we get a bit more handicap next week and on the dim side I have a repair to do to the sugar scoop stern at the deck level. It is not structural and for now is taped up to keep the moisture out of the timber. 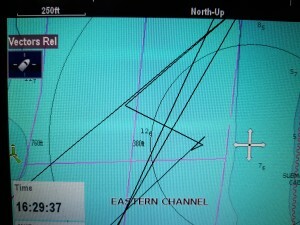 We sailed off the course to do our 720 degrees turns. In the breeze they were pretty quick. Today was almost a repeat of last Wednesday only a little lighter but just as sunny and pleasant on the water. We started towards the pin this week with just Trim below us and were able to climb above her for the first part of the beat. 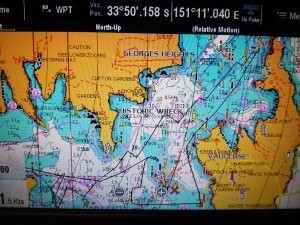 Once we were headed the backwind from Trim started to affect our performance so we tacked to port to cover the fleet. Looking back Trim had now fallen into our dirty air and we had a clear lane ahead. Joli tacked early to port and when they came back on starboard we had to take their transom. After a few minutes they tacked to come with us to the south side of the harbour. The line that Joli took carried them above the island while we had to tack away from a lift. Then on the next shift to the right Joli was inside the whole fleet and steaming away. We also lifted but were crossing tacks with the Flying Tiger and just rounded the top mark inside Hitchhike. 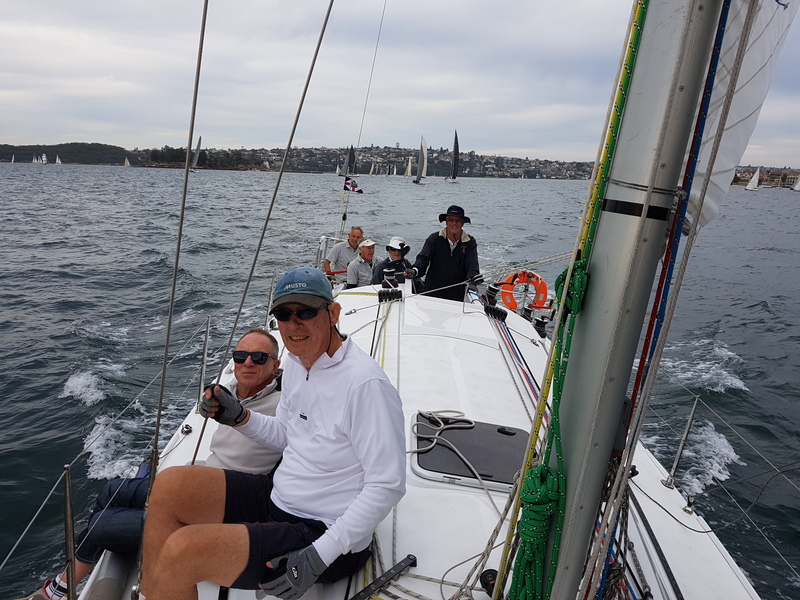 On the poled out square run back to Steel point we held our position and made up a little ground on Joli but they managed the reach into Rose Bay particularly well while we had interference from the Div 1S fleet which took the wind out of our sails literally and figuratively. The Flying Tiger passed us just at the Point Piper mark. From then we were in her dirty air and so lost a little ground on the beat around the Island. A light patch on the way home did not help our position and we could see Allegro in breeze behind making up ground. Hanni slipped past on the long square run so that we finished fourth fastest on the day. 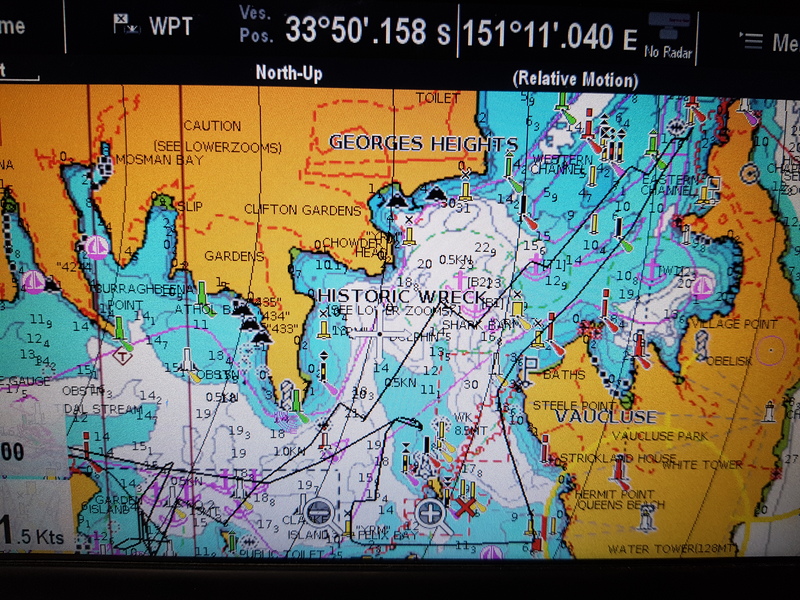 Some very good tacking angles against a small incoming tide. 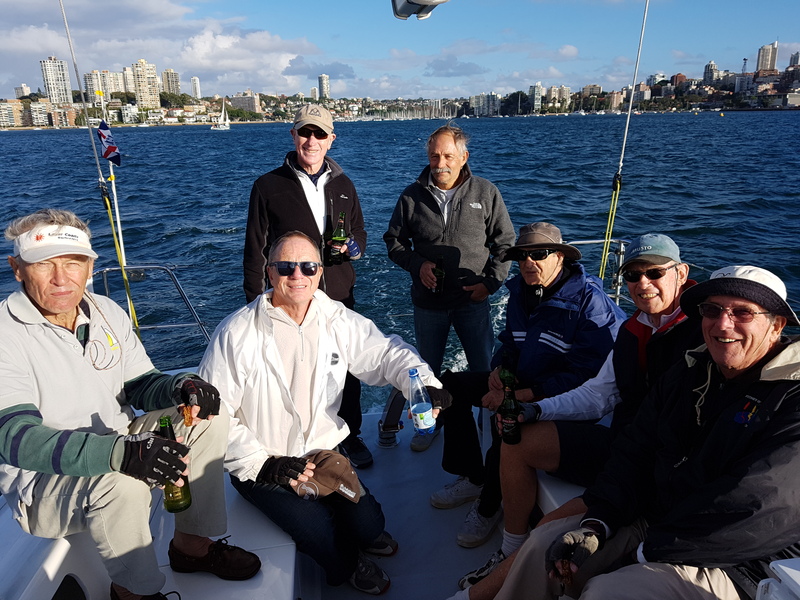 The good points were that we played the backstay well but the wind was a little too light and we needed the higher tension for very short periods. We started well and but for the forced tack away from the Shark Island on the first work seemed to pick the breeze well. The tack away from the lift can be seen on the tracks below. We ran well in the slightly fresher breeze at the top of the course but not so well in the dying breeze approaching the finish. This was the first time we have beaten Allegro and Amante and that put a smile on the faces of the crew. Joli sailed very well and used their strong windward performance to establish a good lead over the fleet. On ORCi they would have given us a beating however on ORCi the Flying Tiger has to give us time and I estimate we would have beaten them be a minute. We were around 10 minutes faster than the we would have been in the old Passion judging from the performance of our competitors from two years age. Now all this better performance did not translate into handicap results where we finished with the same 10 points as last week. Thank to the tiny increase in handicap from last week we managed to take 10 place by one second from Izzi. Whatever the handicap result it is great for the crew to be somewhere near the front of the fleet and finishing 25 minutes earlier than last year. 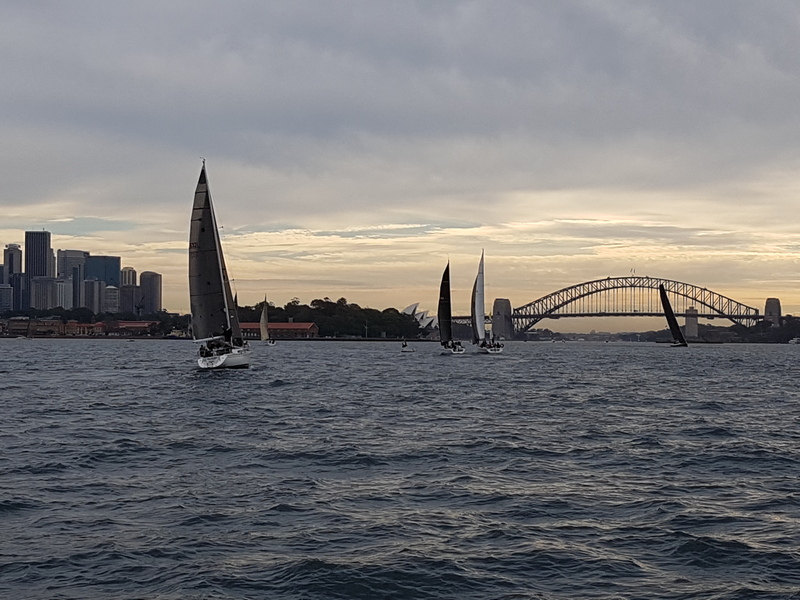 After an hour delay we started the first race of the West Harbour Winter Series in a very light breeze. It was much sooner than expected and while light was enough to get around the shortened course. We were mid fleet in the off the stick results and mid fleet on the very close handicap results where a minute would have made a big difference. While we were last on ORCi we were only five minutes out of first place and close enough to believe that with a bit of slicker crew work we might be up into the prizes. It was good to match the Sydney 38 for the first beat but we were a bit slow with the spinnaker which let them get away. Most importantly we had a very pleasant afternoon and enjoyed the competition with the strong West Harbour fleet. A late arrival of a couple of nice photos taken by GFS volunteers on the Committee boat was another above expectation surprise. Thank you Phil Hare. Passion X and Tana on the long run down the Hunters Hill shore. Phil Hare photo. After a season chasing the super yachts in Division 1s it was great to be back in Division 1 among yachts of similar capability. In a fleet of 17 yachts we were able to start 5 minutes later and finish 20 minutes earlier than we would have in Division 1s. On the day we made a good start at the boat end of a very well set line and mixed it with the fleet to windward in a way we could never do in Div 1s. A third of the way up the beat Izzi showed form and tacked just below our line. At the same time Amanti decided to tack right in front of us giving us a very big dose or disturbed air. Stuck between Izzi and Amanti it took some time to get clear air and wind back up to boat speed. Crosshaven picked the wind shifts perfectly and made a good break on the fleet and Allegro powered away in the fresher patches of breeze. We played the back stay as best we could flattening the main in the gusts and easing the back stay in the lulls and arrived at the windward mark in the top half of the fleet. Trim and Hanni were close behind and Hanni made a good charge up to take our wind. Once we had a bit of separation and had clear air we drew slowly away from Hanni and made up a little ground on Amanti, Allegro and Crosshaven. 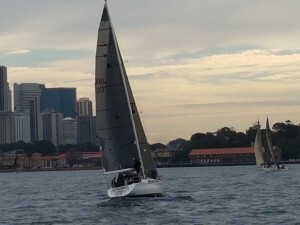 Foreign Affairs was being very foreign and cleared out from the fleet while the very lightly handicapped First 40, Leeward was enjoying the close racing among the lead group. We never quite made up for the dumping Amanti gave us and finished a minute behind her and Allegro but it was a much more enjoyable race for all the crew . 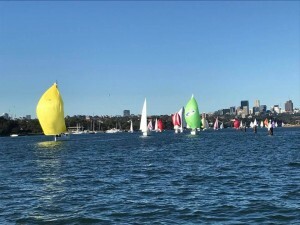 The handicap place down at 12th out of 17 might look better as 10th out of 15 if the two casuals are really casuals but it was a bit of a disappointment being beaten by both the top and the bottom of the fastest times yachts. We needed to be three minutes faster to make it to a podium position and that was never going to be. A happy crew back in Division 1 and mixing it with the fleet. Most of the tacking angles were good but Crosshaven picked the shifts better.